SPEAKING before the annual general assembly of the Cyprus Association of Real Estate Agents in Nicosia, the minister highlighted the legal and administrative initiatives taken by the government to solve the problem of pending Title Deeds. “The general assessment of the four bills promoted by government and passed recently by parliament is that they constitute a significant reform of the legal framework governing the legitimacy of thousands of buildings and the issuing of Title Deeds,” said Sylikiotis. “As a result of the new mechanisms introduced at the Land Registry and the coordinated effort by all relevant services, around 28,000 Title Deeds have been issued from 2009 until now,” he said, adding that the authorities are now able to issue town planning permits for regular developments within three to four months on average. During the first eight months of this year 7,929 property transfers took place compared with the 4,709 contracts for the purchase of property deposited at the District Lands Offices. The Land Registry’s assessment of the market value of the properties transferred totalled € 1,311,438,600.16; 7.9% higher than the sale price of €1,215,923,351.44 declared by vendors and purchasers. In a recent article by Antonis Loizou he reports that only 21% of those invited to transfer their property, thereby gaining its undisputed legal ownership, are prepared to carry out the transfer. @Alan – Although ‘new’ buyers get added protection from developers’ mortgages under the ‘new’ Specific Law, the tax problem has not been resolved. For others who are not aware of the problem, as the law stands, title to a property cannot be transferred until the vendor provides a tax clearance certificate confirming that he has paid the taxes. If the vendor is unwilling/unable to present this certificate at the Land Registry, the only option for the buyer is to pay any taxes owed themselves. This, in my opinion, is totally out of order – it has to be an unfair practice! How can I possibly be held accountable for taxes that you have not paid? Even when/if the buyer and developer have jumped through all the hoops over X years and the Land Registry says ‘OK we are ready to issue the Title Deeds’, there is the teeny weeny problem of the developer’s tax certificate. Without it, the Land Registry will not proceed. Only the Inland Revenue can force the developer to pay his taxes and there is little evidence of them doing so. All the foreign buyers I know are desperate to get their deeds. I have never heard of one who has shied away or intends to – if/when the Land Registry says they are ready. It is native Cypriots who traditionally have not bothered to get their deeds because they never saw the need. With the growing realisation that even they are vulnerable if their developer defaults or goes bust, that attitude is changing (Cypriots tell me). @Pavlos – Thanks for your comments. It would be interesting to have a breakdown by Cypriots/foreigners of the 79% who have opted not to carry out the transfer of title. It would also be interesting to know how many of the 79% cannot be transferred because the vendors are unwilling/unable to provide a Tax Clearance Certificate – or repay their outstanding loans on the property. And there is another issue that may dissuade buyers from transferring title. As reported in a number of earlier articles, Land Registries, in some cases, are valuing properties in excess of 30% than people paid for them. I appreciate that the system is open fraud, but there has to be something wrong with the way these values are assessed. It would only needs a handful of people with more money than sense to pay an excessive amount for a property – and that would skew the market values of properties in the same area. If the Land Registry were to assess the market value of a property when a contract for its sale was deposited, that would go some way to avoiding this overvaluing issue. And the government could impose penalties for delaying payment of the Property Transfer Fees – just as it does for late payment of Income Tax, etc. That would improve timely payment and transfer. The issue, as Mr Costas Apacket erroneously points out, seems to be that whilst a fair number of people are â€˜imprisonedâ€™ and frustrated by the problems revolving title deeds when â€˜push comes to shoveâ€™ (i.e. when the title deed is issued) most people choose not to transfer it over to their name (note the 21% of title deeds being transfer over the past year). Whilst this does not negate the importance of title deeds, it shows the economic hardship of our times (transferring the title means payment of transfer duties and â€“ possible â€“ paying higher Immovable Property Tax). 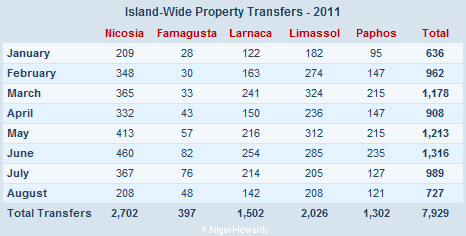 It is also important to note that whilst 40-45% of transactions since 2008 took place in Nicosia and Paphos, according to the data presented these two cities constitute circa 60% of property title deed transfers. Given that the majority of buyers in those two cities were â€“ and are â€“ locals, could this be an indicator that it is foreigners who are choosing not to have the title deeds transferred to their name? Not sure, but this is what the numbers imply. So at roughly 1,000 Title transfers per month it will take 130 months, or over 10 years, to clear the backlog. Still, they continue to allow the registration of new Contracts of Sale for purchasers who have paid their Developer the full price for their properties without being issued with their rightful Title Deeds at the point of Purchase/Sale. This just perpetuates the situation.